Fatima is 59 years old. She hails from Syria’s Dara’a. A farmer and a seamstress with many talents, Fatima worked on a farm with her seven sisters back home, taking care of animals and growing vegetables. “Syria was as beautiful as paradise. We were farmers and there were many orchards, where we planted oranges, watermelons and many other fruits and vegetables. We used to sell the milk from the cows we had. We had two cows back then, and I used to sell handmade baskets for women to carry their olives,” she recalled. After the war in Syria broke out, Fatima fled to Jordan in 2013. Forced to leave everything behind, she now lives in the Za’atari refugee camp. She talks about the people she lost and the life she had, yet she dreams of making new memories and making the best of her situation in Jordan. Fatima speaks about the challenges women face when looking for work in Za’atari camp. Apart from men not allowing their wives or sisters to work outside, “it’s not allowed for more than one family member [under the same UNHCR registration] to work inside the camp at the same time,” she said. Oxfam is pushing for the rules to be changed so that both a man and a woman from a family can access cash-for-work opportunities. All too often, when one family member is provided this opportunity by an aid agency, the opportunity goes to a man. Fatima’s journey through poverty, a lack of job opportunities and frustration is common in Jordan’s Za’atari camp. She, like many women in the camp, has many talents and skills, yet she struggles to find work. Oxfam believes it’s important to design programs to specifically meet the needs of women, providing a skills upgrade but also some immediate income. Fatima’s memories of the war and the people she has lost haunt her, and life in Za’atari doesn’t make for the best of conditions for lone, refugee women. “I feel like I’m a captive because of my age. If women of all ages were given opportunities to work, it would help us to heal and grow after all the destruction and loss we suffered. Working with others would keep us occupied,” Fatima said. She longs for human connection and communal work but, in the meantime, she has forged a world of her own using the talents she has. Fatima proudly exhibits her handmade and recycled crafts that fill every corner of her small caravan. Her eyes lit up with pride and her voice filled with passion and enthusiasm. “These are pillows, carpets, even keychains made of IV tubes,” she proudly says. 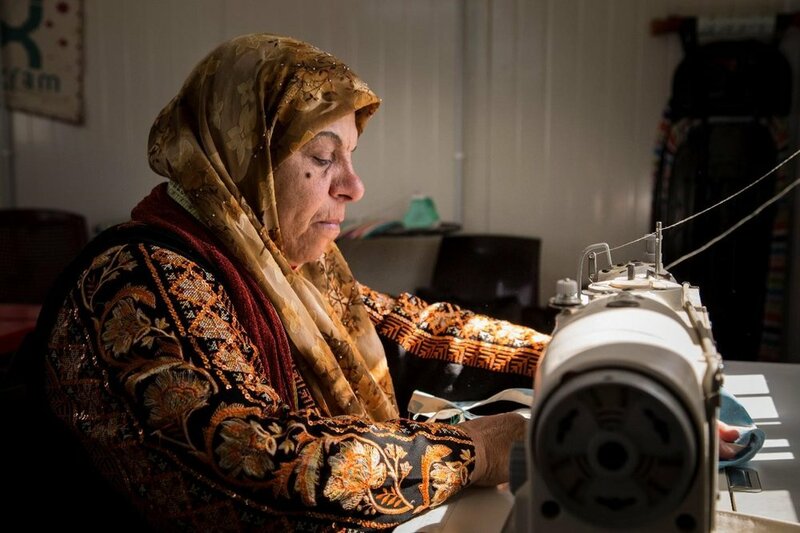 Fatima joined Oxfam’s project in Za’atari camp, working with other women to upcycle old tents into fashionable bags. “When I joined the project, I was very excited... The idea of turning tents into bags is very creative; and it’s what I like to do, creating beautiful things from recycled materials,” she said.